How long until dropper posts go from a sort of running joke to a common feature of pro bikes in cross? Maybe not all that long. As the technology improves and the benefits become clearer, the acceptance of this cross-over tech from MTB seems inevitable, much like a certain bike stopping/slowing technology that dominated bike tech talk for years. 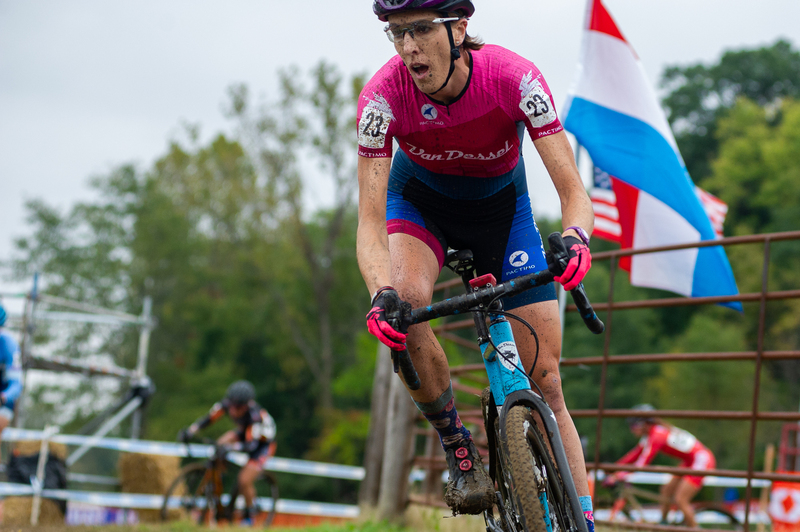 While pre-riding at the Iowa City World Cup Sunny Gilbert tested out a dropper on a course that has presented her with some dramatic technical riding challenges. We asked her and her partner/mechanic Doug Nishamura for their thoughts on the experiment. DOUG: At the shop we’re primarily mountain bikes and everybody wants a dropper post. So, that was pretty seamless when she said she wanted a dropper post on her cross bike. I just needed to find a 27.2 dropper post. When one became available I grabbed it and started noodling around with how to make that work with drop bars, because the levers are different, most dropper posts are designed for flat bar levers. 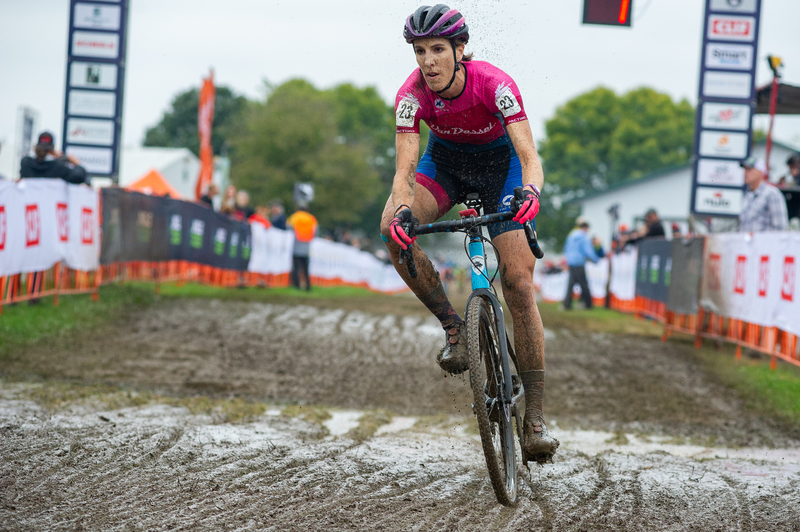 SUNNY: We talked a little about coming down off Mt Krumpit and when I started racing at Jingle Cross I could not get far enough behind my saddle, with my build, to come down. Having a dropper post would have allowed me to lean back and make it a little bit easier to ride with my developing skill set. I was at Roanoke racing behind Caroline (Mani) and she’s super short and the corner that I crashed on she took a much different line than I did and I think it’s because she’s smaller and has a lower center of gravity. It (cornering) might be a bit of an advantage for a smaller rider. I don’t know. It’s more personal to me. As I’ve gotten better I’ve realized how much my saddle gets in the way. We ended up not riding our bikes down Mt. Krumpit. (laughs) And also, the key to getting a saddle up and down is not having large amounts of Iowa mud stuck to it. And I was concerned, never having used it in competition, how that would play. And the other thing was that we were switching bikes every lap and I only have one bike with a dropper on it right now. There was a lot that went into it. But, different course conditions, a dry, fast race, you might have seen me racing it. It’s on a third bike right now but it’s fair game for some of the races we’ll drive to like Cincy or Nationals in Louisville. DOUG: It’s a cable actuated dropper post. So what I did is: I took a SRAM Force front shifter, and removed the pawl so the shifter no longer had a detent and just pulled the cable. So when you push the lever all it does is pull the cable and then return the cable. And that’s what allows us to use the dropper post. It’s just clean and seamless and it doesn’t even look like there’s anything there. It’s stealthy. It just looks like she’s got regular hydraulic brakes and then a front shift lever. But there’s no front derailleur. So if you use that lever it just pulls the cable to drop the post and then raise it back up. The only way it really works right now is cable actuated. And when you’re running the housing through the frame, down the down tube and up the seat tube, that’s a pretty good bend in it. That’s a pretty heavy friction point. That’s one issue I was having with it. Just using regular off-the-shelf derailleur cable didn’t allow the actuator to work properly. It would go up really slow or it wouldn’t retain its height. It would squish down. It just had too much friction on it. Jagwire makes an ultra-slick cable. I went to the Jagwire cable and that’s when it started to work. I would say right now the tchnology is a little finicky because you’re falling into that friction point. DOUG: Up until recently finding a dropper in a 27.2 was pretty rare. And you’re going to get a weight penalty. There are a couple manufacturers that are coming out with really light droppers. They’re coming out with super light droppers that are less of a weight penalty. I mean, how long did it take for disc brakes to really begin to take over the cross scene. 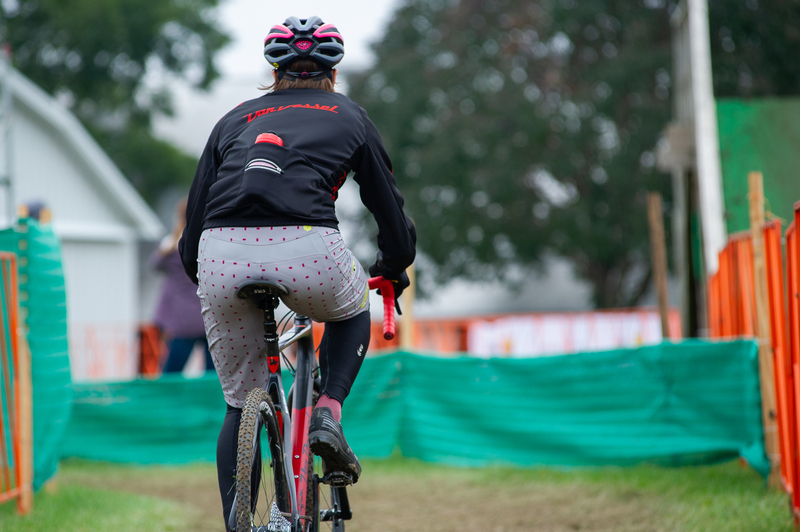 Other than the sponsored riders nobody was riding discs. It’s just a natural progression. I think you’ll see them, unless the UCI makes a ruling against it. SUNNY: I don’t see why they would. I can’t think of any reason why they would make a rule like that. You still have a fully rigid bike. You’re not changing anything about the handlebars. 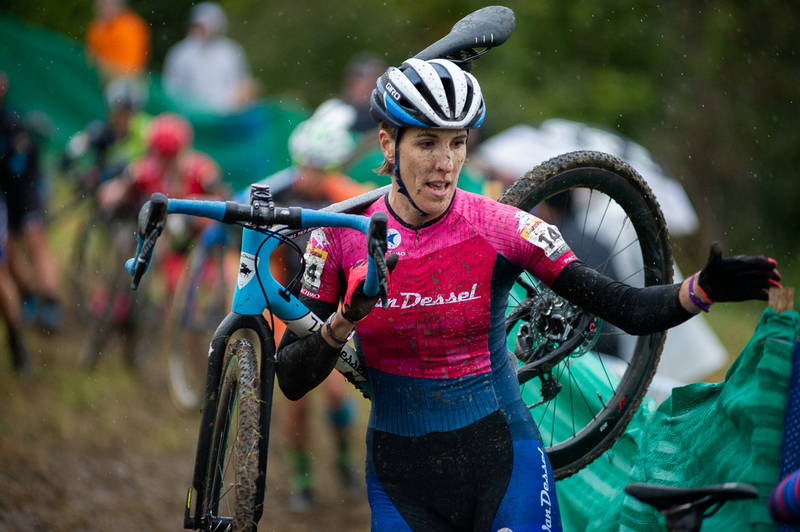 You’re not changing anything about the wheel size or the tire width, which is what the rules are focused on in cross. SUNNY: We have some courses around here that people have been building that have some pretty fun features that you can actually take a cross bike out on. I’ve been taking it (the bike with the dropper) out as my training bike. Every time I hit a feature like that I’ll work on my technique. I’m so fast through the corners now. My lines are different. It’s just fun. It’s almost like rediscovering and learning how to do some of these skills again.